I'm sure you must have been seeing this advert from MTN cos its been on for days now. 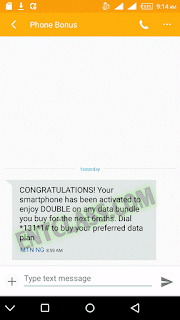 This is a new offer from MTN as it offers 100% data bonus for the next 6 months when you upgrade to a new smartphone. There is no time to still dey carry kpalasa, upgrade to a brand new smartphone today and enjoy 100% bonus on data bundles for 6 months. You will enjoy double data subscription on any data you purchase when you buy a new smartphone from any Official MTN store. To be eligible for this offer, you need to buy a new smartphone from any Store here in Nigeria. You don't need to buy a new MTN sim card. All you need is a new Smartphone. 4. Now dial *131# to activate your preferred bundle plan and your data will be doubled. WHAT TYPE OF DEVICE IS SUPPORTED? All internet enabled device. And you can also use the bonus data on your PC via universal modern or via hotspot tethering, USB tethering. HOW TO CHECK REMAINING DATA BALANCE? To check your data balance, SMS 2 to 131 or dial this USSD code *559*2#. CONGRATULATIONS! 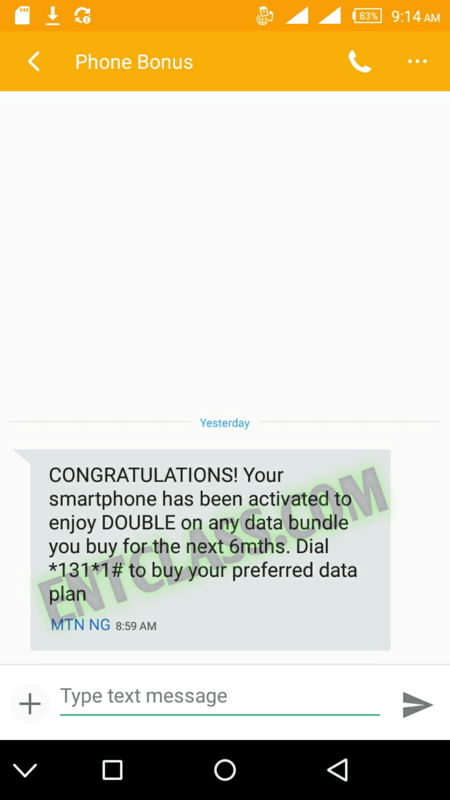 Your smartphone has been activated to enjoy DOUBLE on any data bundle you buy for the next 6mths. Dial *131*1# to buy your preferred data plan. NB: I'm not giving you guys an 100% guarantee that this step will work for you. You just have to try your luck. If you have any problem or questions to ask, i will gladly answer you via the comment box below. If you find it difficult to comment, kindly use our Android app. Just search for Entclass on Google Playstore and download it. Or download it HERE and use it to comment easily. You can also get notified from our Android app of new free browsing cheats published here.